As I reflect from afar on the amazing things that are happening at home in Malaysia, I cannot help thinking of Bob Dylan’s words from “The times they are a changing,” which used to be popular when I was a student at the University of Malaya in the late sixties and early seventies. In the wake of the May 13th race riots, it was a time of challenge and change. We were a different nation then. Irrespective of our religious or racial backgrounds, we were all brothers and fellow citizens with a shared sense of destiny. We lived together, we laughed and cried together, we played and worked together. I won’t go into all the other wild things we did together as well but you get the picture. Many of us still look back on those halcyon days with nostalgia because somewhere along the way we lost our way, lost sight of the dream that was Malaysia, squandered our hopes for our nation and became less than what we wanted to be. We kept silent when we should have spoken out, we turned away when we should have sounded the alarm, we thought of ourselves when we should have spared a thought for our nation. “All that is necessary for the triumph of evil is for good men to do nothing,” Edmund Burke once said. And now we have become a nation where bigots and racists wear their hate and intolerance as a badge of honor and are applauded for it, where “liberal” is a dirty word, where human rights is considered an alien concept, where the corrupt proudly flaunt their wealth, where citizens are demonized because of their ethnicity, their faith, their conscience or their politics. But hope springs eternal and the dream of Malaysia still endures, refusing to go quietly into the night despite the years of neglect, the years of racist and extremist taunts and the frenzy of hate, division and intolerance made incarnate by the likes of ISMA and PERKASA. New generations are rediscovering the dream and taking up the cry for freedom, for justice, for equality. The dream of Malaysia – ethnically, religiously and culturally diverse but united under our unique monarchical system, democratic, free and secular while respecting the special status of Islam – still lives! The recent open letter to the Prime Minister and to the nation by a group of 25 eminent retired civil servants, judges and ambassadors is but a wonderful, and timely, reminder of this. Their eloquent appeal for rational discussion on religion, respect for diversity, and our constitutional foundations struck a chord in the hearts of many Malaysians. I have never been more proud of my foreign service colleagues. In many ways, their letter broke the silence of the silent majority in whose name the prophets of hate and intolerance claimed to speak. Already there has been a significant outpouring of support for their message of moderation, tolerance and respect for all. Over 100 NGOs have come out in support of the Group of 25 while campaigns like “I am #26” and “Kami juga #25” have added to the momentum. The momentum for change itself has been building for quite some time now. By boldly positing the idea of ‘Reformasi’ in the hearts and minds of a population weary of the long years of Barisan Nasional (BN) misrule, opposition leader Anwar Ibrahim awakened something in the Malaysian body politic. Anwar may never get to be prime minister because of the outrageous persecution he has suffered but his contribution towards making Malaysia a better nation is incalculable. The government may have stymied his quest to lead Malaysia but they will find it harder to stymie the aspirations of the people for change that he sparked. 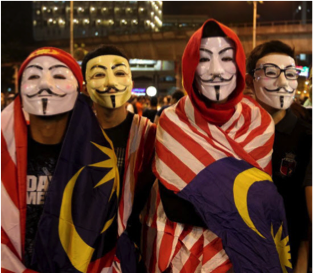 Since then, a long list of courageous Malaysians and civil society groups have risen to challenge the BN government by speaking out, blogging, writing, marching, voting and taking action. Who can forget the hundreds of thousands of people who came out to support movements like BERSIH or NEGARA KU or TURUN or monitor the election process? Who hasn’t admired the work of SIS, SUARAM or even SUHAKAM and the nascent student movement led by Adam Adil, Fahmi Zainol and others? And who can forget the courage of Malaysians like the late Karpal Singh and Irene Fernandez or Marina Mahathir, Amiga Sreenevasan, Azmi Sharom, Aziz Bari, K.J. John, Haris Ibrahim, A Samad Said, Zaid Ibrahim, Hasmy Agam, Dr Asri Zainul Abidin, Bishop Paul Tan, Zainah Anwar, Cynthia Gabriel, Saifuddin Abdullah, Major Zaidi Ahmad, Mujahid Yusof Rawa, Dyana Sofya and so many others? Or the long and lonely principled struggle of men like Lim Kit Siang and Kassim Ahmad? How heartening to hear the growing crescendo of cries for the liberty, for the freedom of expression and assembly, for the justice, for the fundamental rights that are enshrined in our constitution. How thrilling to see citizens not just defending the constitution but depending upon it for the legitimacy of their struggle. Never have we needed it more to protect our rights and to challenge the unlawful actions of an overbearing executive or those who would turn our nation into another Iran or Pakistan or Saudi Arabia. They’ve been bold, forthright and unequivocal in their support for the secular nature of our constitution and the founding principles of our nation. It is men and women like these that make me proud to be a Malaysian. And it is men and women like these that give me hope that someday we shall overcome and realize the dream that is Malaysia. For all that has been accomplished, the movement for change is still in its infancy and cannot be taken for granted. The pushback against the group of 25, for example, began almost immediately: suddenly these distinguished public servants were vilified as traitors to the race, enemies of the faith and puppets of the opposition. If they stand firm, and I have no doubt they will, the momentum for change will grow. If for any reason they falter, the Malay middle ground might well be lost. It is also a time to be wary: the more power slips from UMNO/BN, the more desperate they will get and desperate men are known to do desperate things. Expect more harassment and intimidation of opposition and civil society groups and more issues that divide. Beware of sudden national emergencies or threats to national security that require a further curtailment of civil liberties and fundamental rights. Watch out for more gerrymandering and election-related smoke and mirrors. But the momentum for change has begun and there’s no turning back. There will be victories and there will be setbacks. There will be voices of hope and voices of despair. There will be wise decisions and poor choices. But the process of rediscovering the middle ground and regaining the consensus that made us strong has started and that is reason enough to rejoice for now.